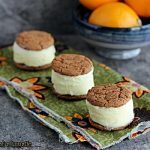 Great recipe for a no egg, meyer lemon ice cream that is wedged between cookies to make a wonderful Meyer Lemon Ice Cream Sandwich. I really didn’t mean to. It just kind of happened. but then I was like nah. Look at these little cutie ice cream sandwiches. Totally worth a little cheating on the recipe. Usually my weekends go one of two ways, either I spend all my time with the famdamnily, or I spend all weekend working. Usually if the family is free, and not working, my time is devoted to them, If they are working, or otherwise engaged, then I work all weekend. However yesterday my time seemed sucked up by something I would have rather not been doing. I hate when that happens. Something happens to shift your focus, you get distracted and your day gets ruined by some nonsense you would rather not be dealing with. Life. It happens. So it’s now 6 am on Sunday, mini-me just left for work, which is not typical. She’s suppose to be off on Sundays. It’s our one day a week where we don’t have to get up early or have school or work commitments. Anyhow I am sitting her finishing off my post for today as I let yesterday get away from me. Lesson learned I say. Keep priorities in check and don’t let nonsense distract me from doing what I need to do. Or spending time with family. Which to me is uber important. I figure with mini-me getting older that it won’t be long before she sets off on her own like b-dude did. So I need to enjoy those rare days where she doesn’t have plans with boytoy, or work, or school commitments. Those need to be girls day out. That explains why I cheated. How did I cheat? Well I simply used store bought cookies for the sandwiches instead of making my own. Normally I make my own, from the ice cream to the cookie. Like my Red Velvet Ice Cream Sandwiches. Those were all from scratch. That was my plan for these. But as we all know, the plan doesn’t always happen so plan B needs to be at the ready. That tends to be when I employ cheater desserts. Now this is only half cheater, yes, that’s a thing. I made the ice cream from scratch. But cheated with store cookies. It happens. So there you have it folks. Kim cheated….again. It seems to be a recurring theme here. I’d feel really bad about it but I’m too busy shoving Meyer Lemon Ice Cream Sandwiches in my pie hole. In a mixer combine the whole milk and sugar. Whisk on medium speed until sugar dissolves. Add lemon juice and salt and whisk again for about 1 to 2 minutes on medium speed. Add heavy cream and lemon extract. Whisk until fluffy, about 3 to 5 minutes. Cover your bowl and place in the fridge for at least one hour. I let mine age overnight. 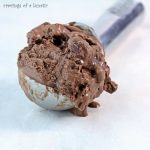 Remove and transfer liquid to your ice cream maker bowl. Make sure it's frozen prior! Place your bowl on the ice cream machine, set it all up and turn on. Let it whir for about 10 to 15 minutes. Now line a shallow dish or container with parchment paper. Pour the ice cream into that dish. Pop in the freezer for at least 4 hours, or overnight. If leaving for an extended period make sure you cover it. Remove dish from freezer. Use the parchment to lift out the ice cream and set it on a board. Use cookie cutters or scoop out by hand. Place ice cream on one cookie, then place the second cookie on the other side. Give it a little squeeze. You eat them straight away or save them for later. If saving for later remember to wrap them tightly in plastic wrap. Serve with a big old puckery smile! This has inactive time which I really wish Ziplist would add. You don't cook it but there is freezing time involved. So consider it has at least 1 to 4 hours of inactive prep time in your calculations. It has to set in the fridge for at least an hour at the first stage. This can be used with regular lemons. Remember when storing ice cream sandwiches for later use ALWAYS wrap them tightly in plastic wrap. Trust me on this one! So worth cheating, let me tell you. Lovely little bundles of sunshine. Our hostess for Sunday Supper this week is Amber. She blogs at Mama’s Blissful Bites. Thanks so much for putting this together Amber. Also a huge thank you to our fearless Sunday Supper leader, Isabel. She blogs at Family Foodie. 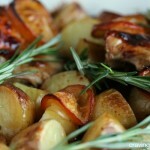 Stop by all the Sunday Supper crews blogs and check out their amazing dishes! Cheating is wrong…but oh so right. Keep your priorities straight. More family, less drama and work. 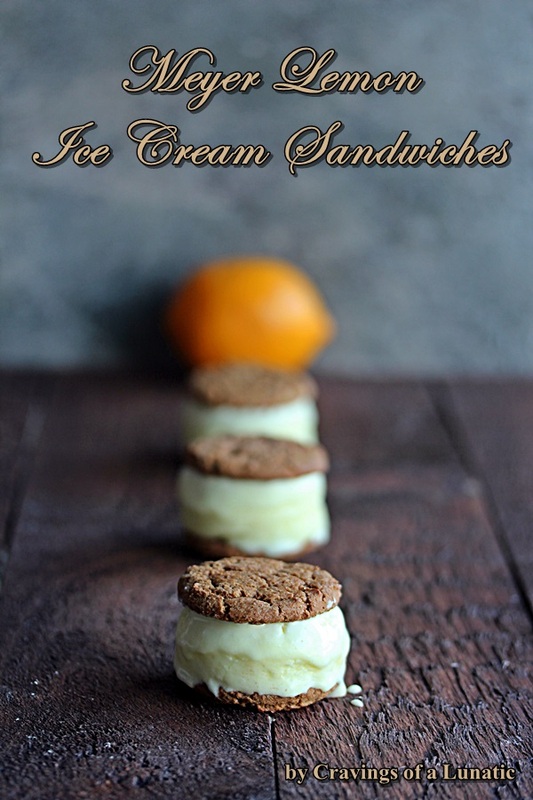 What adorable ice cream sandwiches and so refreshing too! I’m a Meyer lemon fan as well! Rock on! Thanks so much. I love meyers, just such a nice taste to them. Right back at ya. lol! 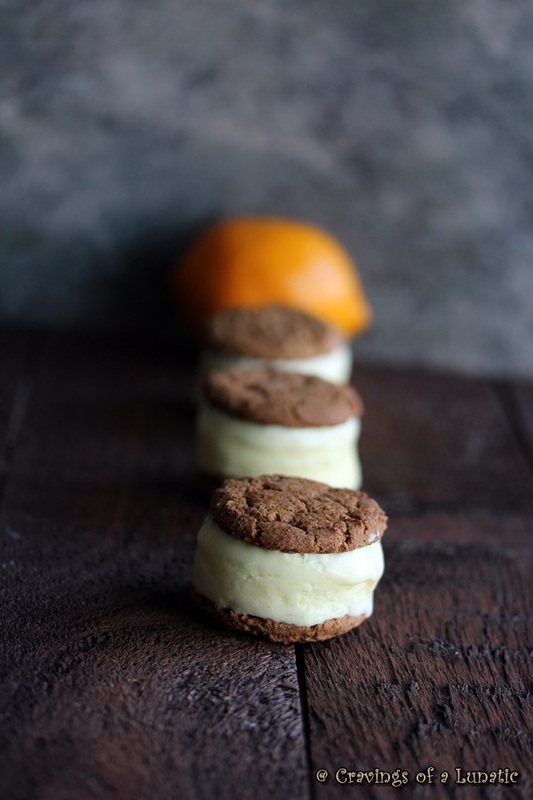 Hey we all have to cheat sometimes and adding your Meyer Lemon Ice Cream that looks so creamy good to the cookies, probably blew those cookies out of the water. They have probably never had such yumminess sandwiched between them! What a great idea!!! Thanks Jennifer. They are so good. I may have scarfed one or two while shooting pics. Awe thanks Helene. You are too sweet. I know what you mean about distractions. We’re moving and I need to be packing, but I keep getting distracted with other things (most of which are also things I need to do). The bright side? Moving forces us to clean the house 🙂 No worries on the cheating – I think if you were a true “cheater” you wouldn’t have fessed up. Oh you poor dear. Moving is so stressful. If you ever need a guest post let me know. I’d be happy to help out. So my thought is I should move so my house will be clean…lol. Thanks Liz. I loved the lemon with the ginger. So good. Are you awaaaaaake? Cause I need an ice cream sandwich. Life does happen, as we all know, so we’ll forgive you that little cheat! 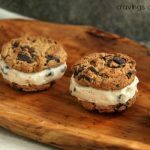 😉 And I have to say, when it comes to ice cream sandwiches, for me the cookie part is usually an afterthought – it’s the ice cream I’m after! I love all lemons, but Meyer lemons are special. So I’m sure this dessert is, too. Thanks so much! That is true. I want to perfect the soft cookie for the outside with the holes. I am nothing if not determined. If I have to eat 1000 sandwiches on my way to perfection well that’s just a sacrifice I’ll have to make. Yum! 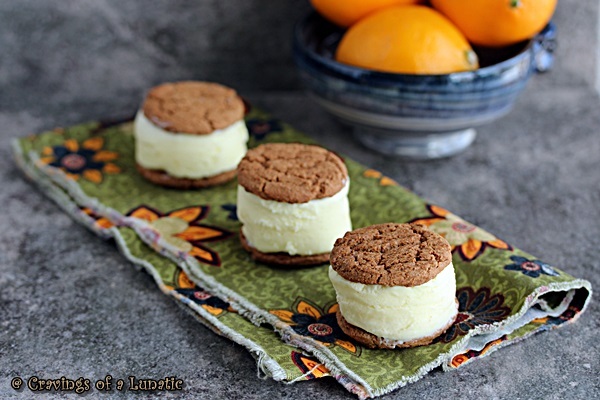 I bet a gingersnap with the refreshing citrus ice cream is amazing! They are also really pretty. It’s an amazing combination. I just want to sneak one more before bed. And thank you so much. These are adorable! I love the flavor of the ice cream sandwiches too-so springy! This sounds great! But, at what point do you add the heavy cream and lemon extract? Thanks! Oh my gosh Susan, good catch. I was up after only about 2 or 3 hours sleep this morning so I knew there would be something awry. I’ve already edited it and a huge thank you to you for catching my mistake. I’d kiss ya, but that’s wildly inappropriate and flies in the face of my germophobe ways. Lol! Lol, glad you like them. Oh how fun to move to the South. Warm all the time, that’s my dream. Canada is cold man. Cheating is alright..sometimes it saves to much time when there already so little time to go around! 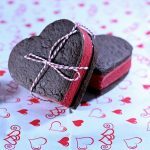 These are very cute and look delicious too! oh Kim!! you are too cute! Who cares if you bought the cookies! You made the ice cream and that’s the best part! YUM!! Meyer lemon ice cream?! can’t wait to try this!! Thanks Alice. It’s so good. I mean off the charts. 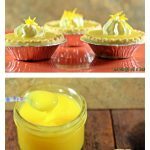 Yummy, what a great way to use Meyer Lemons! Thanks Carolyn! I’m having so much fun with all the lemons hubs brought home. But you still made that amazing sounding ice cream which is even more amazing knowing how distracted you were. We all that those days, sadly I seem to be having more of them as my daughter gets older. I can’t wait for warmer weather so I can enjoy these tasty treats. Thanks Laura. I love making ice cream. It’s way too much fun. I wish I could say life slows down as the kiddos grow up but my gosh it’s so not true. I still feel like I’m going at mock speed most days. Yum!!! I’d say it was worth the cheat too! 😉 Love that you can use nilla wafers or gingershaps to mix it up! Thanks Diana, any excuse to crack open a box of cookies and slap some ice cream on them is a good day in my book. Me too, something so yummy about meyers. I can’t get enough of this ice cream. Life happens and you’ve got to roll with the punches. These look beautiful and well worth the cheating! I can just taste the sweet and tart ice cream. Yum!! Exactly! They are so yummy. I am really enjoying this ice cream way too much. Cheated or not, these look delicious; so I guess you’re forgiven. And, they’re so darned cute! Thanks so much Jennie. They are sort of cute, aren’t they! I love Meyer Lemons so much, they’re so amazingly crisp and sweet, the perfect send-off for winter. I wish I had an ice cream maker so I could make ice cream with them too! I know, they are natures perfect little citrus. I bet you could totally whip this in a mixer or blender and freeze it in a container. Might take a little longer but worth a shot. If this is what your cheating creates, cheat away, dude, cheat away. Thanks dude. I enjoy a good cheat. But you made the ice cream – that more than makes up for the little cheat and family time is super important. Our children are with us for such a relatively short time. Thanks so much Suzanne. And you are so right. I love hanging with my fam. Abso-freaking-lutely! Maybe 2 sandwiches cuz you deserve extra. I think cheating is perfectly okay, when it comes to semi-homemade that is! These are awesome! Thanks so much Dorothy. I love ice cream sandwiches, it’s a wild addiction. Oh my, these are so pretty. And tasty too, I’m sure. Thanks so much Aimee. The ice cream is wicked addictive. I keep stealing spoonfuls. I am all about plan B! And these look great – I adore meyer lemons! These look gorgeous and they sound so delicious! How cute! I am so in love with these!! and I totally LOVE the “dark and moody” photo! You make the best ice cream flavors! The Meyer lemon flavor sounds sooo good. And in an ice cream sandwich, wow, even better. Beautiful pictures too. Ummm… Meyer Lemon + Ice Cream? How can you go wrong? If this is cheating, I don’t ever want to play by the rules!! Sometimes you have to take shortcuts! These look so tasty! lol, Kim, you totally deserved the cheat. You get a free pass, girl. Sometimes things don’t turn out as expected (this happens to me all the time! I always have grand plans for my weekends/evenings and inevitably, something comes up). Like you said, you made this luscious, dreamy meyer lemon ice cream from scratch and that’s something to celebrate! I love these photos – they’re beautiful! I never had Meyers lemons I need to try this soon! I love lemon ANYTHING, and in an ice cream sandwich? Shut the front door.